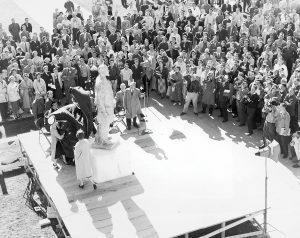 On Nov. 7, 1958, workers reveal sculptor Ortho R. Fairbanks’s (’50) depiction of BYU founder Karl G. Maeser, standing in front of the Eyring Science Center, its original location. With trillions of inhabitants, your gut microbiome affects your health in more ways than scientists ever imagined. A BYU program is sending doctors, sonographers, and students across the Pacific to help relieve a hidden sorrow. In the biggest revolution in transit since the Model T, BYU experts are working to make backseat drivers of us all. Homecoming 2012 honors a university icon: the 100-year-old Karl G. Maezer Building. These are the esteemed individuals and power couples who built BYU as we know it. The building will be a five-story conduit for collaboration, right down to its thoroughfares.